Which of These Conversation Troubles With Men Would You Like To End? Truth is you are not alone. You see, my clients have all been there. all the wrong things – and then losing him. Problem is… few women know the MOST EFFECTIVE ways to gain a man’s undivided attention through conversation, or how to quickly and easily shift from one conversation to the next without losing his interest, putting him to sleep or bringing up subjects that will have him bolting for the nearest exit. Is it any wonder then why so many men bounce from one woman to the next or refer to some women as boring? Or why many of them don’t phone after that first date? Now suppose you could sit down, read a simple short report, follow the time-tested advice created by a relationship expert and try out a few proven strategies, and then see your conversations, dates and relationship change for the better. Well, it isn’t if you have the right advice. Advice that shows you how men think, what topics you should avoid and which ones they are crazy about! You see, conversation can be effortless, fun and anxiety free when you know how MEN think. Bring up the right topic, and you will have him hanging from every word you say long into the early hours of the morning. Bring up the wrong topic and you will see him lock up as tight as Fort Knox. Everyone at some point has had ‘THE’ conversation. I’m referring to that conversation that started bad but ended amazing. You know… the one with someone where you could tell the person was not interested in what you were saying. They were looking over your shoulder, naval gazing at their phone or seemed eager to change the topic. But now remember the moment it changed. You know… when you stumbled on that topic that meant A LOT to them. It could have been their children, their work, their partner, their love of art, music or writing. Do you remember how their eyes lit up? Or how the next 10, 20 minutes or 30 minutes flew by as they raced through anything and everything to do with that topic? Perhaps it almost felt like you were having a conversation with a new person? That’s because in many ways, you were. You had tapped into ONE thing that meant a lot to them. The same applies with men. In fact, there are specific psychological loopholes in a man’s mind that once you know them, it makes conversation a breeze. You’ll kiss goodbye to those awkward moments of silence between the last bite of your meal and the next. You’ll stop watching the seconds tick over like paint drying, hoping that a friend will phone you and rescue you from another boring date. You’ll see an end to all the anxiety, humiliation and self-esteem issues that you have had over wondering if there is something wrong with you. And the best part is… you will see that it’s not your fault. In this highly effective report for women it reveals the truth behind conversations with men and how to effortlessly captivate them, understand how they think and connect with them through fun, inviting and satisfying conversation topics that all men love – without being boring, enduring uncomfortable silence or losing him in the process. This eye-opening report gives you step by step techniques that are simple and easy for anyone to follow. Developed specifically for any woman who is single, in a relationship or who may even be married – it delivers practical, down-to-earth, breakthrough conversation topics and techniques that have been proven to work with any man, in any situation and in any culture. In fact, it was created for my clients who were struggling with the fear of being rejected. When you correctly use the steps, and ignore the voice of doubt in your head, you can bypass all the common problems and avoid the struggle that plagues countless women. Now I know it seems impossible to believe, but it’s true. Why 86% of women totally miss the boat when it comes to avoiding topics that leave men feeling bored or even worse – running from you! Imagine the swell of confidence you will feel and how quickly you will benefit from this report as it shows you exactly what you need to know about men from a man’s perspective. That’s easy. You’re probably already aware that most people don’t fix their problems and relationship related issues until it’s nearly too late. But I urge you to not wait until it’s too late. You also know researching this yourself, could cost you thousands of dollars as you are no-doubt going to find yourself testing out a lot of bogus products, and heading down roads that lead to dead ends and frustration. Never mind going on even more dates that go badly. Alternatively you could consult with me at several hundred dollars an hour, and who knows realistically how many hours it would take to convey everything I’ve learned. But I’m not going to charge you anywhere near that amount. And that’s because it’s delivered digitally, you can download it instantly! So go ahead click the buy button below and start reading this in the next 60 seconds. Listen, I’m so confident that Conversation Topics Men Actually Enjoy report is something you won’t want to part with that I’ll remove all the risk from the decision of taking action now, by offering this bullet proof reassurance. Order now, access in the next 60 seconds and read the entire report. Put it into action, test it out for yourself and see if what I’m telling you here is accurate. If you don’t feel at any point in 60 days that you have received 10x the value of what you paid, just shoot me an email and I will refund you instantly. No questions. No Hassle. No time wasted. That’s a pretty bold guarantee and potentially puts me on the hook for the entire investment you make today, but I’m not worried. Not only because “Conversation Topics Men Actually Enjoy” is the most comprehensive report you will read but it’s also because I have seen plenty of men and women purchase this and keep it. Click the “Add To Cart” button now and start reading this in the next 60 seconds. 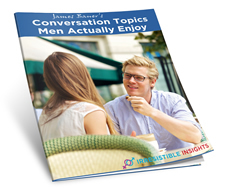 The “Conversation Topics Men Actually Enjoy” Report so I can discover how men think, and how to captivate them through conversation topics they love! 10 highly effective question and answer case studies from women who experienced exactly what I have. A completely 60-Day Money Back Guarantee, so that there is no risk when I purchase now. Click Below To Access Instantly! For your own good, and before I raise the price! Get this now! It could be the purchase that changes your life forever and helps you finally start enjoying the relationship you deserve. Just click the link above to order. It’s safe, secure and gives you access instantly to the product. P.S. – I’ve done all the hard work for you, the research into what you need to know, what steps you need to take, and what conversation topics to choose so that your conversations with men are effortless. Now the next step is up to you! Read everything on your PC, Mac or Tablet and discover how simple, eye-opening and effective it is to captivate a man’s undivided attention through conversation. P.P.S. – And remember, you have NOTHING to lose by trying this out today, because you’re fully covered by my 60-day money back guarantee. Look… if you haven’t had luck with any other solutions… what do you have to lose by trying this? Take action and order now… while it’s fresh on your mind.